You’ve watched the movie, but have you listened to the soundtrack? 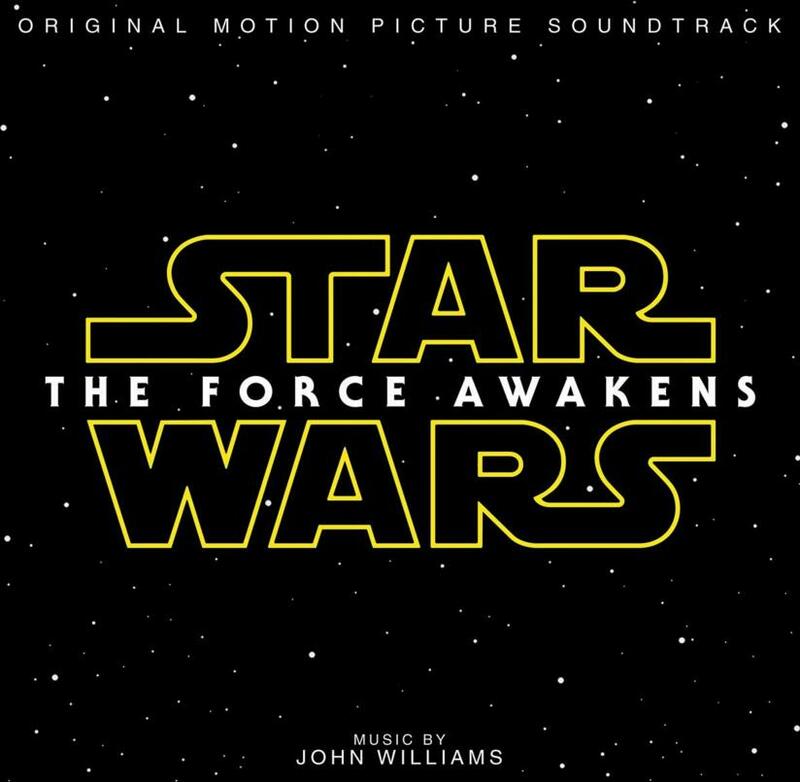 Star Wars: The Force Awakens by John Williams, a journey for the ears. Here’s our take on the soundtrack. When it comes to orchestral soundtracks, I have to admit I’m not real big on them. It’s not something I normally purchase, seek out, or listen to. I love them in the movies, but listening to them by themselves is a whole different ballgame. Still, I do enjoy music, and after seeing the movie, I wanted to dive into the soundtrack. After a week of listening, here are my thoughts on each track. Main Title and The Attack on Jakku Village (6:25) – After the opening theme, you get dramatic, militaristic beats that shift to a quiet spell, some action, then picks back up for the big, bombastic sounds of Kylo’s theme as he makes his dramatic entrance. There’s some sad drama, then it bounces back to the military theme as it goes back and forth from quiet to drama to Kylo’s theme to military notes. At 6:25 it’s a good sized track that’s not too long, not too short. It sets the mood of the movie and it’s easy enough to visualize the opening of the movie by following the notes. The Scavenger (3:39) – Starts with a lone flute, a small build up that tosses in another lone flute with an enchanting melody. There’s a small touch of Clint Eastwood type western music as we get Rey’s theme, which channels a bit of Ennio Morricone. There’s a lot of soft notes and soft music which carry the song out. I like the beginning more than the end, but it’s nice. I Can Fly Anything (3:11) – The soft opening quickly moves to big bombastic action notes right out of the gate, upbeat optimistic hero cues, and a change up to questioning tense danger cues which end out song. I like this one as it has a storytelling feel to it as the song progresses and shifts from one cue to another. Rey Meets BB-8 (1:31) – Light bell like notes start this one out with almost a twinkling sound. There’s a hopeful cue and a quiet medley with a hint of danger. To short to stand on it’s own, it kind of bleeds into the next track. Follow Me (2:54) – Has kind of a weak opening. It’s soft and not very distinctive. When it does kick in, it’s pretty good, going back and forth from danger to quiet. There’s a curious soft theme, danger and action kick in, fast notes, slow downs, up ticks, etc as it continues to bounce back and forth. While the beginning is forgetful, the rest is enjoyable. Rey’s Theme (3:11) – I can’t help it, the opening of Rey’s theme makes me think of Clint Eastwood westerns. There’s also a little bit that follows which some have compared to Harry Potter, and I agree it strikes that kind of chord. There’s light notes, a build with optimistic hero cues, and it just kind of continues on a journey with hints of challenges and struggles. It ends with light notes and finishes off a rather complete and satisfying theme which is my favorite on the soundtrack. The Falcon (3:32) – Back to the action with tense, fast notes, danger, worry, struggle, and triumph. “The Falcon” picks up the pace from “Rey’s Theme”, moves the overall story forward in the listener’s mind, and has enough length to be a complete track. Not bad. The Girl with the Staff (1:58) – Starts with a quiet opening and soft hints of Rey’s theme before transitioning to danger cues. Then it goes from quiet to menacing notes, even a horror vibe, which it ends on. Too short, though, so it feels incomplete. The Rathtars! (4:05) – Bounces between quiet and moderate cues with a light Force theme, danger and action, discordant notes touching on fright and horror going back to action then struggle before wrapping up with victory notes. Interesting track. Finn’s Confession (2:08) – Has a soft, touching opening that builds but still stays low key and mellow. At a little over two minutes, you might think it’s not long enough to be complete, but there’s enough shifts in the song to make it feel satisfying. Maz’s Counsel (3:07) – Is mostly quiet. It eventually builds up and ends with a crescendo. I don’t care for the quite part, but the build up and crescendo is good which kicks in at two thirds of the way through. The Starkiller (1:51) – A sad, touching, haunting melody. I really like this one. It packs in the emotion that we really didn’t have in the movie when watching an entire solar system blow up. But is the sadness because of what the First Order is doing, or because of what Kylo Ren is allowing to happen and embracing? Kylo Ren Arrives at the Battle (2:01) – A few soft cues open it up, then it moves to militaristic notes. There’s a change up of fast notes, then the big bombastic notes of Kylo’s theme with chase music and a repetition of quiet moments, chase moments and a dark fade. It almost feels complete but just a few cues shy of being so. The Abduction (2:25) – This one has a very dark opening that shifts to a hero theme. The opening is pretty cool with some very memorable cues, but it also feels like it could have been developed into something longer. The transition from the dark opening to the heroic ending is a little awkward, but the opening and ending are good. Han and Leia (4:41) – Has a soft opening with the Han and Leia music coming in. Then there’s dramatic, militaristic music, a quiet downshift, some wistful music, some ominous notes, the princess cue, more ominous notes, the Force theme, and a fade out. This one has some nice cues and feels complete. March of the Resistance (2:35) – Has a very militaristic vibe with some cues that show up earlier in the soundtrack, but this one is fleshed out. Very different from Imperial March, and I think it fits the resistance well. Snoke (2:03) – Opens with a male choir chanting. It’s ominous, and later dark melodic chords kick in with the choir in the background and a few charged strings sneaking in, but that’s it. It doesn’t feel like it’s complete, more like a tease at Snoke than a fully realized theme. Hopefully this one will be fully realized in the later movies/soundtracks. On the Inside (2:05) – Has a mellow opening, then big horns come in. It mellows out again, then hits a chase feel. It speeds up and slows down, but it’s not very memorable as there’s not much to it. There’s interesting sounds in there, but overall, it’s not very good on its own. Torn Apart (4:19) – Has quiet, emotional start with heartwarming notes, then some sadness, then Kylo’s theme. As tension ramps up, the moment kicks in, and it’s almost Lord of the Rings like there. Then action music, Kylo’s bombastic cue, chase music, and a quiet end. Good track as this one takes you on a journey and brings back the scenes from the movie. The Ways of the Force (3:15) – Oddly starts out with creepy notes before transitioning into the Force theme and going back to ominous notes. There’s action/chase music, dramatic notes, Kylo’s theme, the Force theme again, more drama, the burning homestead cue, then fade out. Another nice track for storytelling. Scherzo for X-Wings (2:32) – Is different. Lots of notes, upbeat, fast paced, hints of familiar music, almost like a John Williams remix. Farewell and the Trip (4:55) – Interesting, upbeat track with full, vibrant sound. Kind of climatic, with a hint of the princess cue in there I think, and of course the Force cue, but something else, too. There’s a little bit of Rey’s theme that winds it down. Neat track overall. The Jedi Steps and Finale (8:51) – Builds to a nice crescendo with a touch of mystery that slips into the Force theme and then end credits. Afterwards it touches on various themes-Rey’s Theme, Snoke, Kylo Ren, March of the Resistance and the finale. Nice epic track to end things out on. So listening to the whole thing repeatedly, I’ve found it’s a good soundtrack to listen to at work. It plays well in its entirety, which is something I can’t say for many orchestral soundtracks. I’ve tried to listen to others at work, be it the prequel trilogy or the original trilogy, but I’ve never really enjoyed it. This one on the other hand is quite enjoyable. I’m not saying it’s a better soundtrack than those others, but it is more enjoyable to listen to while doing something else. My biggest gripe, however, is that there is no Mas Kanata bar music. Big misstep there as that is one of the songs I was looking forward to most after seeing the movie. Otherwise, not a bad soundtrack. I give it a four out of five metal bikinis.